Oats and new hay seeding, early July. I planted this field in early April. I plant 2.5 bushels of oats, 10 lbs. of alfalfa, and assorted grasses. Check out “2009 New Hay Seeding,” if you would like more detail. We plant this mixture as soon as the ground is fit in early spring. Oats are a fast starter and suppress any weeds that germinate. The alfalfa and grasses are slow to start, but come on strong after the oats are harvested. Many farmers are going away from planting a companion crop to their new hay seeding. If the oats are not managed well, they may kill the new seeding. Here are some tips we have found to prevent this. 1. Spread no manure on the field during the preceding year. My opinion is the nitrogen in the manure causes the oats to grow too tall and will lodge, (go down), as it matures. 2. Plant an oat variety with strong standability. 3. Plant an early-maturing oat variety. The earlier the oats can be harvested, the better it is for the new seeding. 4. 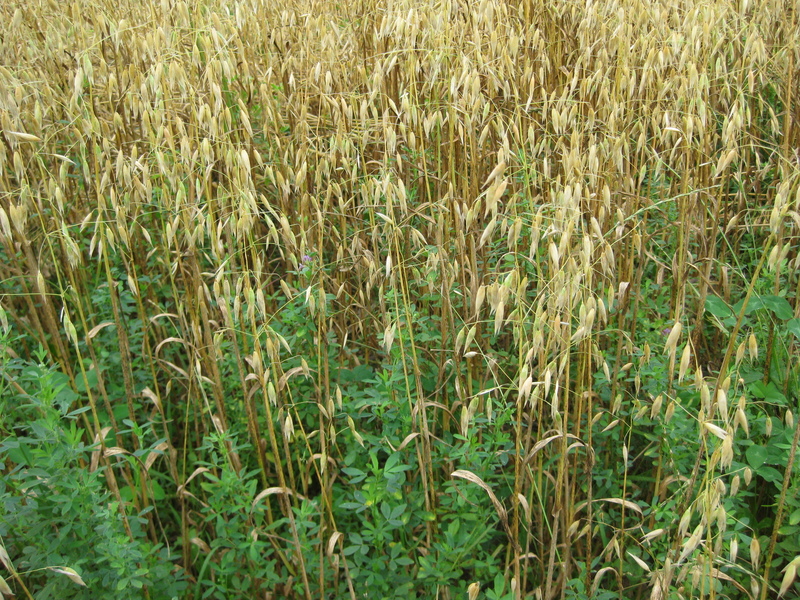 If a field has had manure, or you feel the oats may lodge for any other reason, cut the oats as a forage crop in June. This crop can be dried and baled, or ensiled. It makes excellent feed for cattle. We harvested our oats in late July and they will be mixed into the hog rations at an inclusion rate of 20-25%. Gestation rations can include a higher amount of oats. The straw will be dried and baled and used as bedding for hogs in the hoop buildings. Oats can be an excellent companion crop for new hay seeding. 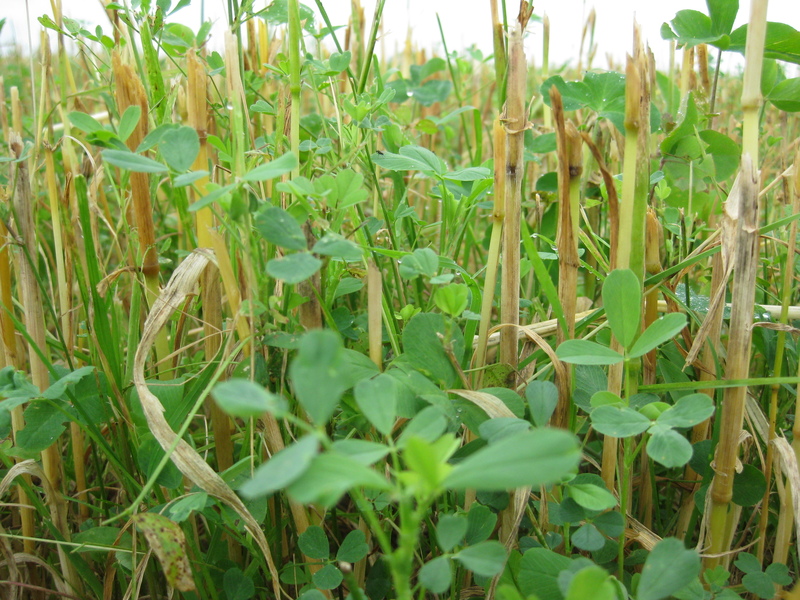 If everything goes well, look at the beautiful alfalfa, clover, and grasses, green and growing after the oats are harvested. This entry was posted on Sunday, August 15th, 2010 at 8:21 pm and is filed under Curious crops. You can follow any responses to this entry through the RSS 2.0 feed. You can leave a response, or trackback from your own site.